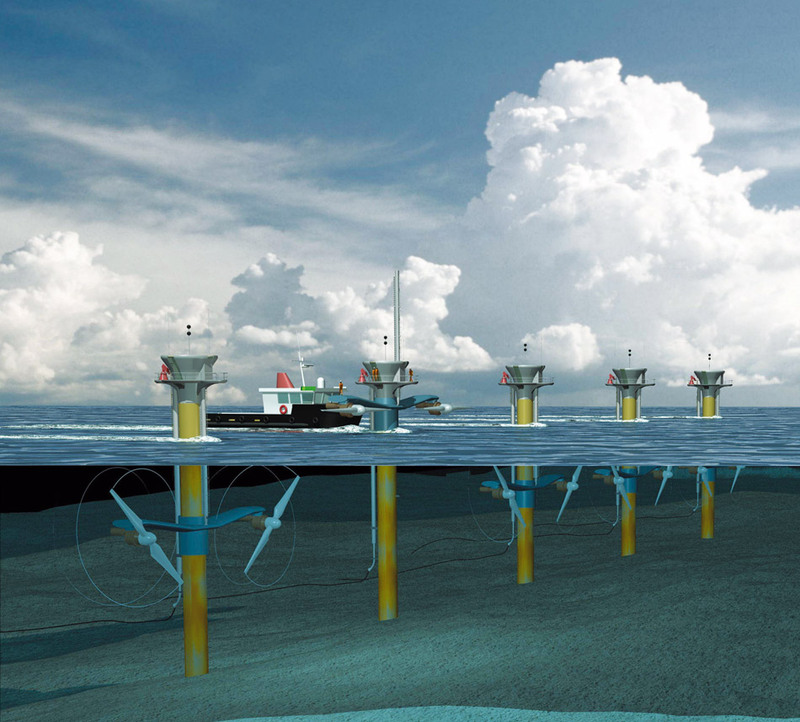 7.12 a > Power plants designed to harness ocean energy are already operating at several sites in Europe. The oldest is La Rance tidal power station near St. Malo in France, which was built in the 1960s. For many years it was the largest of its kind, with an output of 240 megawatts. 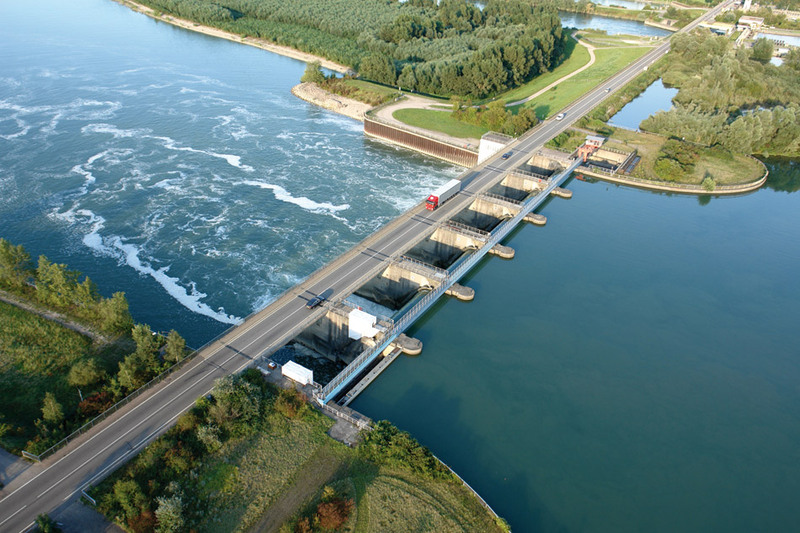 Tidal power plants work in a similar way to power plants at a reservoir – except that the water masses do not flow downhill but are moved back and forth with tidal flows. Unlike other forms of ocean energy, tidal energy has been utilized commercially for some time. The La Rance tidal power station began operations in 1966 at St. Malo on the Atlantic coast in northern France, where the La Rance River flows into the sea. At high tide the water flows upstream through the large turbines of the power station, and at low tide it flows downstream again. The 240 megawatt (MW) power station (1 megawatt = 1 million watts) has a similar output to a gas-fired power station. Similar facilities have been constructed in Canada, China and Russia over the past 20 years, although these are considerably smaller. A 260 MW tidal power station integrated in an existing dam is scheduled to come on-stream in South Korea this year. The United Kingdom has been planning to construct a major tidal power station at the estuary of the River Severn between England and Wales for some time. The location could supply enough energy to meet 7 per cent of the United Kingdom’s entire power needs. However, critics fear that the construction of the dams could devastate vital nature reserves and bird sanctuaries. The environmental damage could be substantial. For this reason alternative concepts and locations are now being discussed. 7.12 b > Tidal energy can be converted to electricity by underwater rotors, as at the SeaGen plant off the coast of Northern Ireland in Strangford Lough. One facility has already been constructed which feeds electricity into the grid onshore. Others will follow. Ocean current energy can also be harnessed using submerged rotors which are driven by the motion of the water. It has been estimated that ocean current power stations and tidal power plants together could harness several 100 terawatt-hours of electricity per year worldwide. For some time now tests have been carried out on some rotor concepts, such as the Seaflow system, the prototype of which commenced operations off the English coast in 2003. Its successor, SeaGen, is now rotating in the Strangford Narrows off the Irish coast. Under this concept two rotors are mounted on the tower of the plant. This increases the electricity yield and balances out the high construction and start-up costs. Such ocean facilities face much harsher stresses from currents and wave movements than wind turbines, for example, and for this reason extensive endurance testing is called for. Nonetheless, the SeaGen technology is closely based on the wind turbine model. The blade angle and rotational speed can be adjusted to suit the prevailing current. Other concepts focus on fixed, non-adjustable systems. Ocean thermal energy conversion (OTEC) utilizes the temperature difference between warm surface water and cold deep water to generate power. In order to drive the steam cycle in an OTEC power station, the temperature difference must be at least 20 degrees Celsius. The technology is therefore more suited to warmer marine regions. The warm water is used to evaporate a liquid which boils at low temperatures, producing steam which drives a turbine. Cold seawater (4 to 6 degrees) is then pumped up from a depth of several 100 metres and used to cool and condense the steam back to liquid form. Until now the cost of OTEC technology has been considered prohibitive, requiring pipelines of several 100 metres in length and powerful pumping systems. The US government supported OTEC development and initial testing in the mid 1970s, but withdrew its funding in the early 1980s. Interest in the technology has recently been rekindled, however. An American-Taiwanese consortium is now planning to construct a 10 MW facility in Hawaii. Furthermore, public institutions and businesses in France have launched the IPANEMA initiative, which aims to promote both ocean-based renewable energies and OTEC technology. It is estimated that OTEC has the potential to harness several 1000 TWh of electric power each year. Unlike wind and wave energy, this form of electricity production is not subject to fluctuating weather conditions. 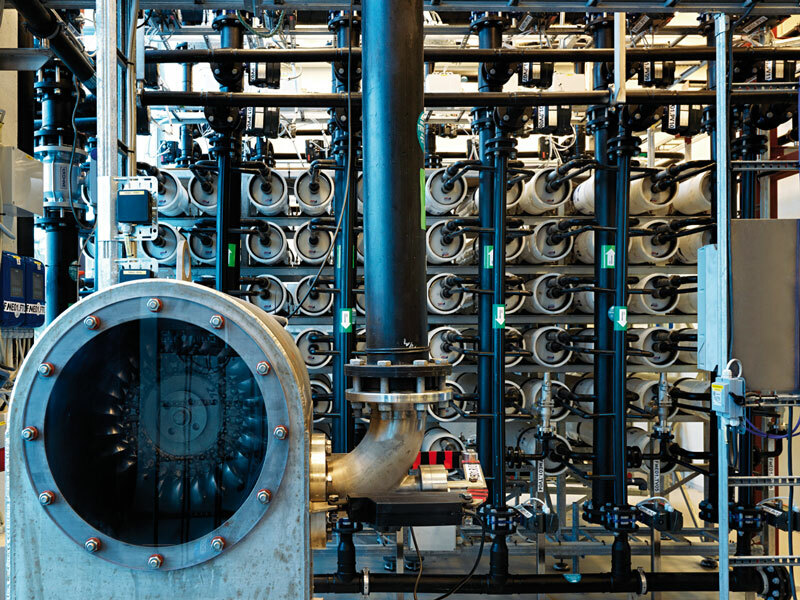 7.12 d > The world’s first osmotic power plant on the Oslo Fjord in Norway derives energy from the differences in salt concentration between saltwater and freshwater. A thin membrane separates the water masses, building up pressure which drives a turbine. The osmotic power plant is an entirely new way of generating energy. It exploits the osmotic pressure which builds up between freshwater and saltwater when they are pumped into a double chamber and separated by a special semi-permeable membrane. The technology is still in its infancy. In 2009, however, members of a Norwegian syndicate constructed the world’s first osmotic power station on the Oslo Fjord. The plant is designed principally to develop this technology, at present generating only a few kilowatts of electricity. However, the sustainable global production capacity of osmotic power could in future amount to 2000 TWh annually. There is no doubt that major advances have been made in developing technologies to harness renewable energy from the oceans. Although many technologies show commercial promise, however, virtually all of them depend on subsidies because they are driven by small, young businesses. Apart from the technological and economic risk, one difficulty is to achieve project sizes which would make such investment viable. Subsidies for these technologies are therefore essential. Various nations offer such programmes. The US Department of Energy and the European Union are already investing several 100 million euros in their development. The complex approval procedures for plants and grid connections also need to be simplified. In Germany the approval of offshore wind plant is entirely in the hands of the Federal Maritime and Hydrographic Agency, but in the USA plant operators must battle their way through various agencies and approval processes. Relaxing the rules would be of great benefit.